Annnnd we're back! That's right, Nerdy Monsters, my collectable plushie and geeky accessory shop is back in business. (And by business I mean I've made one sale since re-opening officially on Wednesday, woohoo!) Yesterday I send out the word to the mailing list crew. (it's free if you want in) I have sold Nerdy Monsters at craft fairs and to friends and friends of friends in person, but in all honesty, I've only ever sold one online. One of the things I'd like this blog to be about going forward is my personal Etsy (and online selling in general) journey. I want to be honest with you about my experience and even help others in the same boat. So since I'm being transparent about it all, my most popular item in 'Nerdy Monsters' is not a nerdy monster. It's a feminist button. Which is fine, I made it because it's something I wanted to make for myself to wear and thought I'd see how it did online. (Turns out, it does well.) So I will make more, and Nerdy Monsters, as a shop, might morph into Nerdy Feminist Monsters. Which, honestly, is the next logical step for it. 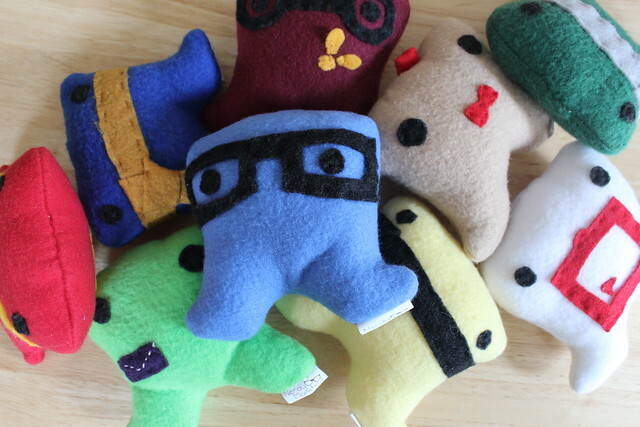 I want to keep the dream alive about the little nerdy fluff balls though, and I think I will make more for different fandoms in the future...even if they don't sell as often. I also want to make other things out of fleece and felt and maybe even stickers soon. (Childhood dream!) So here's my piece of advice for aspiring Etsy sellers: Make what sells but also make what brings you the most joy. Bring on the monsters!